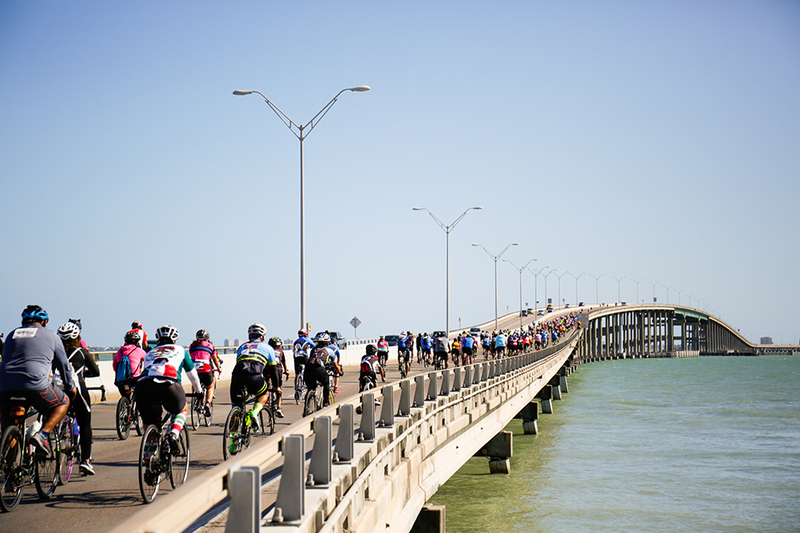 If you were in town this past Sunday, chances are you noticed the sea of brightly-colored bike riders that made their way steadily through Laguna Vista and Port Isabel, and then all at once across the Queen Isabella Memorial Causeway. The Rotary Club of Historic Brownsville hosted its Annual Ride for Rotary this past weekend, and accommodated participants of all ages and from across the Rio Grande Valley. Last year, the event even had registrants come from Corpus Christi, San Antonio and Reynosa, Mexico to take part in the occasion. The Rotary Club of Brownsville began hosting this group ride 11 years ago, but changed the route two years ago so that participants could enjoy riding over the causeway. Riders had the option to register for a 30-mile route or a 50-mile route, with both of them concluding at Louie’s Backyard on South Padre Island. To prevent extensive traffic build up in Port Isabel, riders were instructed to meet in the parking lot at Pelican Station, and travel in one big group across the bridge at 10:30 a.m. sharp.